Coquitlam’s tallest condo tower is coming soon! Boasting over 20,000 square feet of indoor and outdoor amenities plus easy access to the Evergreen SkyTrain Line which is directly across the street, the 567 Clarke + Como Coquitlam condos presents the intersection of life and style. The 3,000 square foot entrance lobby is both grand as it is welcoming while the Mezzanine level features 7,600 square feet of outdoor amenity spaces. The Lifestyle Amenities are located on Level 28 and features over 6,600 square feet of amazing on-site amenity spaces including a gym, clubhouse lounge and games room. Level 49 is where residents will find the 567 Clarke + Como Sky Lounge at over 2,600 square feet with breathtaking views. 567 Coquitlam condos are brought to you by Marcon Developers and will be released for presales this Spring 2017. The developer is Marcon while the unique architecture is by GBL Architects. Trepp Design is the award winning firm responsible for the interior design of the 567 Clarke + Como Coquitlam condo residences. There will be approximately 364 condos for sale starting Spring 2017. Initial draft features include nine foot ceilings in all main living spaces, air conditioning as well as laminate floors throughout and Bosch and/or Fisher & Paykel kitchen appliances. All homes will also come with in-suite laundry appliances. Marcon introduces 364 homes coming this Spring to the intersection of Clarke Road and Como Lake Avenue. 567 Clarke + Como will feature 49 floors of views, over 20,000 square feet of state-of-the-art amenity spaces and unbeatable Skytrain access to The Evergreen Line across the street. More information is available online at www.marcon.ca. Or you can register your interest on this page and we will send you any information once available once presales start. Sales are expected to start in Spring 2017. The Coquitlam 567 Clarke + Como condos will feature a tonne of amenities that include outdoor and indoor spaces. There will be a lounge/party room, multi-media room, rooftop patio with views, BBQ areas, bike storage, car wash area, underground parking, children’s play area, storage lockers and possibly even a squash court and yoga studio. The 567 Clarke + Como Coquitlam condos will also feature a guest suite (fully furnished for over night guests) plus a fitness gym and dog wash station. More to come. 567 Clarke + Como is a residential, 49 storey, concrete condominium building located on the corner of Clarke Road and Como Lake Avenue in the Burquitlam Neighbourhood Centre. This Burquitlam rea estate development will offer 364 homes with a mix of 1 to 3 bed + den bedroom homes. Coquitlam’s tallest tower will boast over 20,000 square feet of indoor and outdoor amenities and access to the Evergreen Line Skytrain directly across the street. 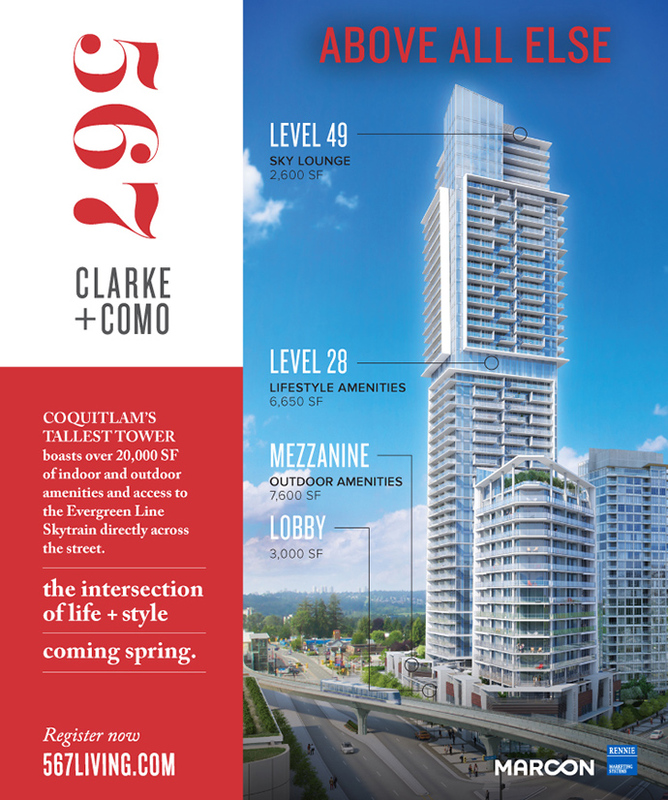 The 567 Clarke + Como Coquitlam condo tower is brought to you by award winning builder Marcon and will be the tallest high-rise in the area. Many of the homes will have sweeping views and residents will be just a quick walk away from the Evergreen SkyTrain Line for easy access to downtown Vancouver, the rest of the Tri-Cities, Richmond/YVR and Vancouver/Burnaby. Otherwise known as Uptown Coquitlam, the 567 Clarke and Como condo tower will combine both Life and Style and will boast some of the most impressive condo amenities. These include expansive indoor and outdoor amenity spaces featuring a 3,000 square foot lobby entrance, lifestyle amenities, over 700 parking stalls underground and an enviable location just two minutes walk from the SkyTrain Station. At 49 storeys in height, 567 Clarke and Como Burquitlam tower will also feature 2 commercial units plus a 15 storey purpose built rental tower that will house approximately 101 residential units and 3 commercial units located on the north end of the site which has a flatiron or tapered architectural style. The residential market tower at 567 Clarke + Como will be located on the south end of the project site. The podium height is approximately 28 feet and was designed to respond to the elevated Evergreen SkyTrain Line guide way that flanks the Carke Road edge. There is an outdoor urban plaza as well.